These are some other websites that are managed by Pegasus Web Productions. We hope you enjoy them! 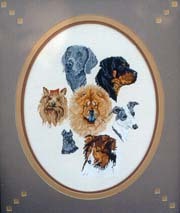 Be sure to visit Stephanie's needlework dog designs for counted cross stitch and needlepoint on the Pegasus Originals, Inc. website. Here you can see all of the counted cross stitch, needlepoint and limited edition prints offered by Stephanie S. Hedgepath, plus much, much more! The Needlecraft Showcase The largest mall on the internet devoted to the Needlearts. Custom Email Addresses Find out how to get your own custom email address using welshcorgi.com!